A ludicrous modern day pirate story, The Island scoops the sludge from the bottom of the horror-at-sea barrel. Thousands of vessels are disappearing in the Bermuda Triangle, and journalist Blair Maynard (Michael Caine) decides to travel to the area to investigate, taking with him his young sullen teenaged son Justin (Jeffrey Frank). In the Caribbean, Blair meets Windsor (Frank Middlemass), an ex-patriot living in a house filled with strange artifacts and renting out pleasure boats. Blair and Justin head out in a small boat, and are soon attacked by vicious, seemingly crazed pirates. Blair manages to kill one of the invaders before being overpowered and taken prisoner to the pirates' base on an uncharted island. 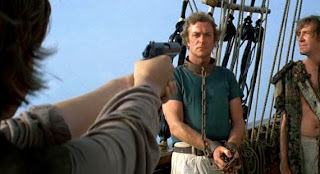 Blair and Justin meet the pirate leader Nau (David Warner), who spares Blair's life so that he can impregnate Beth (Angela Punch McGregor), the wife of the pirate killed in the raid. Meanwhile, Justin is brainwashed and trained to become a killer, before eventually being adopted by Nau. Blair repeatedly tries to escape but is recaptured every time, although gradually his relationship with Beth warms up. When Windsor unexpectedly shows up on the island, the incredible story of the pirates becomes clear, but Blair's fate appears doomed. The third movie to be adapted from a Peter Benchley book (after Jaws and The Deep), The Island, with a screenplay written by Benchley, finds the author flailing around for any sort of an original story to create terror in the water. Finding none, he conjures up a truly awful tale of an enclave of descendants from 17th century pirates, hanging out undetected in the Caribbean for about 300 or so years, and responsible for years of mass murder on the open ocean. The first 30 minutes of the movie are reasonably tolerable, director Michael Ritchie creating a fair amount of tension with a series of silent and deadly attacks on small boats. But The Island takes a sharp turn towards farcical territory when the pirates and their island are introduced, the movie rapidly disintegrating into a bargain-basement pantomime that almost beggars belief. The lunacy peaks with a pirate raid on a coast guard vessel, followed by a blood-thirsty climax with a machine gun that can be aimed to destroy its own vessel. Michael Caine sleepwalks through the movie, finding a new gear in his level of disinterest, his droopy eyes fixed only on the paycheque waiting at the end of filming. David Warner seems unsure whether the whole pirate thing, complete with ridiculous clothes, ramshackle housing and inbred idiots for cohorts, is for real. The pirates can neither be taken seriously nor are they meant to be funny, and as a result The Island sinks without a trace.